After three days of tallying results from the certificates of canvass, (COCs) the National Board of Canvassers had finally wrapped up the official canvassing for the Presidential and Vice Presidential race. Rodrigo Duterte has emerged as the runaway winner for the presidency, confirming the results of the partial and unofficial quick counts of COMELEC and PPCRV. Rep. Leni Robredo won as Vice President in a very tight race. She garnered 14,418,817 while Marcos got 14,155,344. Leni led Marcos by only 263,473 votes. Filipinos watched the canvassing avidly, focusing on the VP race. Considering the accusation of electoral fraud coming from the Marcos camp, there was some uncertainty of the outcome of the VP race until the last minute. Three hashstags #TagumpayNiLeni, Leni Robredo, and Northern Samar were on Twitter's trending topics during the last few hours of the canvassing. A bit later, #VPLeni was on top of the trending list. You may be wondering why Northern Samar is included in the list of topics related to the congressional count for the VP race. FYI, Leni's supporters say her victory is also a fitting birthday gift to her husband, the former Jesse Robredo, whose birthday falls today, May 27. The joint session was terminated at around 7:15, after which the people in the session hall broke into applause. 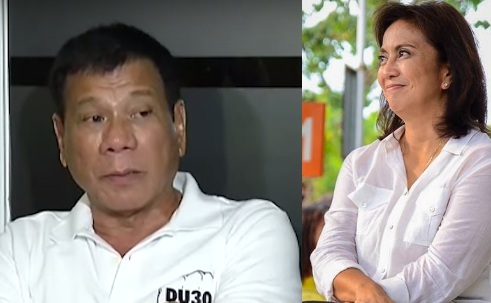 So for the next six years, fellow Filipinos, we will be ruled by President Rodrigo Duterte of Davao and by Vice President Leni Robredo of Camarines Sur.